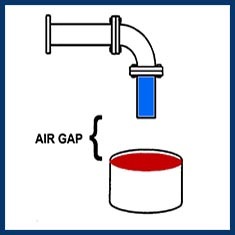 An air gap is the physical separation (vertical distance) between the lowest opening point from any pipe or outlet supplying water and the flood level rim of the non pressurized receiving vessel or receptacle. Considered the best method of backflow protection, this non mechanical means of protection, protects against both back pressure and back-siphonage. Regrettably, because this is an open system, it is impractical to use with most closed piping systems.